Ald. Howard Brookins (21st) wants city sanitation officials to find better ways of keeping rats from gnawing through plastic trash cans, he said. CITY HALL — Ald. Howard Brookins (21st) is opening a new front in his war on rodents. Brookins invited two private vendors to the City Council's Finance Committee meeting on Wednesday to hawk products they say would prevent rats and squirrels from chewing through the city's 1.1 million trash cans, a fix he called "low-hanging fruit" likely to save the city money and promote public health. "It seems to me that there's an easy fix out there that we're not promoting as a city ... and I would like to be proactive," he said. "But I haven't been given an exact blueprint from animal control or [the city's Department of Streets and Sanitation] about how to prevent this and keep the streets clean." In November, Brookins introduced a resolution asking city sanitation officials to explore new ways to keep vermin from burrowing through city trash bins. That was before a squirrel jumped into his spokes during a midday bike ride, leaving him with severe facial injuries and a tongue-in-cheek avowal to "ban squirrels." His Far South Side ward has "always been near the top of the list of calls for Animal Control," mostly due to the number of critters who venture out from the Dan Ryan Woods, he said. Two vendors contacted Brookins saying they could sell the city products preventing animals from gnawing through the plastic cans, and on Wednesday, representatives of both companies testified to the committee. Local inventor Vince Ehrenberg showcased a zinc lid cover called the Vintopper he said would "misalign" rodents' jaws if they tried to chew through it, sentencing them to a slow death by starvation. "I'm not necessarily here to kill everything, but I believe the product I have is a natural deterrent," Ehrenberg said. "What would eventually happen is ... the animals know not to go near it." A representative of Polyarmour USA, which sells military products to the U.S. Department of Defense, described a spray-coated trash cover that would "be like a hot sauce" for anything that tries to chew through the material. The city's sanitation department has not issued a request for proposals to target the problem, but commissioner Charles Williams is open to testing "any viable product" that could guard the city's garbage from pests, he said at the committee meeting. 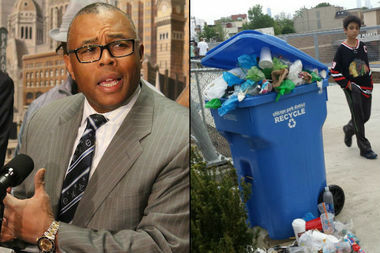 About 37 percent of the city's million-plus plastic bins are "often damaged with rodents," Williams added. While Brookins does not expect the city to buy products from either of the companies represented on Wednesday, he hoped their presentations can "give some ideas" to guide sanitation officials toward their own solution, he said. And if he can settle a personal score with the city's squirrels in the process, that might just be an extra bonus, he added. "I think I'm close to getting my revenge," Brookins joked. "I'm planning on doing Bike the Drive this year, so hopefully there aren't any squirrels out there."